Snow blowers are designed for removing snow of course but it may surprise you to find out that they can be affected by the cold weather and not perform as well if it is super chilly outside. Even though they are built for removing white fluffy stuff in the dead of winter, they are still machines that have components which are not cold-proof. If you have a snow blower that decided not to work today because it was too frosty outside then these troubleshooting tips may help a lot! Plus it always helps to have your snowblower tuned up with regular small engine maintenance in Ottawa to ensure that your snowblower can handle the brunt of the cold weather without issue. So what are some of the common cold weather snowblower problems you may encounter? 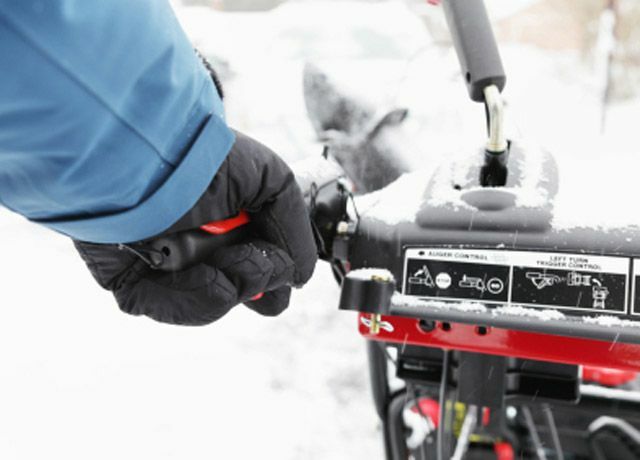 If you find your snowblower is having difficulty starting on cold days then the quick fix would be to check the fuel shutoff valve is in the “ON” position. Sometimes the simple solutions are the easiest to overlook so this is something you should check first if you find the snowblower is not starting as expected. In addition to the fuel shutoff, you should check that the throttle is set to three-quarter speed or higher. After checking these two issues, your gas tank would be the next potential reason that your small engine won’t start up. Just like ourselves, we are a little grumpy if we have to work out in the cold on an empty stomach. It’s the same thing with your snowblower and it is a good idea to top up your fuel tank each time you use your snowblower to make sure that your snowblower starts without a hitch each time you go to use it. If after checking to make sure your snowblower has enough gas you find that it is still not starting then you will want to check your spark plugs to ensure there is the right size of gap and that there is no fuel in the hole. If there is fuel in the hole, simply turn over the engine a few times to rid the spark plug of the fuel because your spark plugs should be dry in order to start your small engine snow blower. These are all things and more of course that we would check for you during a routine maintenance of your snow blower. If you are having trouble starting your snowblower during cold days then it is a good idea to book a small engine repair and maintenance visit from one of our mobile snowblower maintenance technicians. We look forward to helping you get your snowblower back up and running to ensure that you can get your snow removed with ease so you can get back to more important things like spending time with your kids playing in the snow instead of struggling to start a snowblower on a cold day!